In The Lesson of this Century Popper's purpose is to warn us against the increasing violence and egoism of our society. What solutions can we offer to the problems of the environment, demography and corruption? How can we prevent the violence our society engenders? How can we preserve our democratic system while at the same time paving the way for global peace? 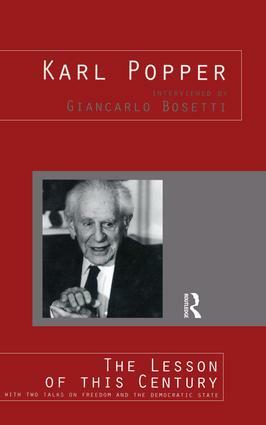 Popper believes that the philosopher has a duty to intervene in politics and he utters a clear call to all of us to recognise our responsibilities. He reminds us that it is our actions which will create the world of tomorrow. The interviews in this volume were originally given to the Italian journalist Giancarlo Bosetti. The volume also includes the transcript of an interview about the moral dangers of television not previously available in English.